Street life on Snowden Street. The Mass Observation team lived at 85 Davenport Street which was next to Snowden Street. The terraced houses were demolished in the early 1980s and replaced with modern homes. The only remaining building in this photograph is the mill which can be seen at the back left hand side of the photograph, which is now used as industrial units. 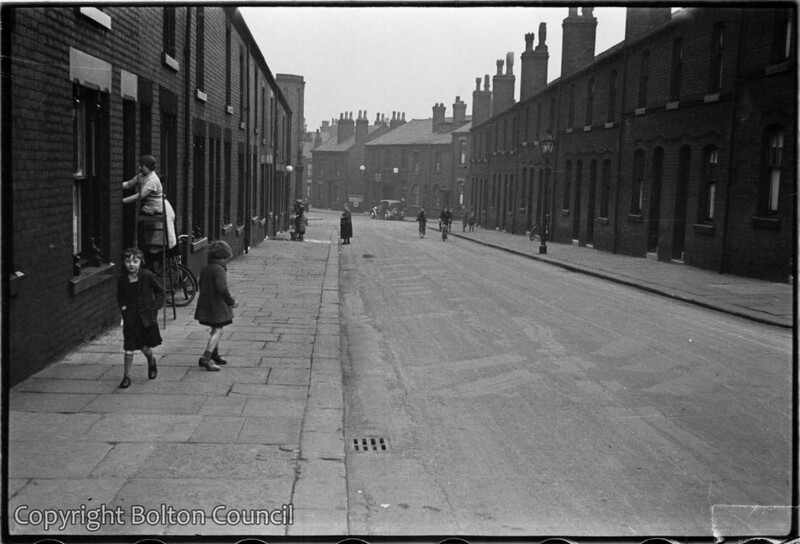 Humphrey Spender returned to Bolton to record the demolition of Davenport Street and the surrounding area for the documentary film Return Journey. I have travelled all over the world and this is the street I remember best. What great memories of my ancestors who have passed away, and my brothers playing here. My Uncle Arthur, Aunti Edie, and cousins Norman, Cyril and Kenneth (Roocroft) lived in the house at the end – it could have been 95(?). You could see in the Mill from side bedroom window. remember outside toilet was a wooden board with a hole and a bucket way down! I was scared I’d fall in. I loved visiting – happy memories. Hi Sue, I didn’t live in the Snowden Street but I lived in St. Helens Road in a terraced house and as you mensioned those outside toilets I remembered those toilets, ours was after a long way through the garden at the far end of the yard. The toilets had no electricity and we ran with a box of matches through the dark to light the candles to have at least a bit of light. Those matches were also very good for frying the spiders that overwintered in the toilet, they weren’t very fond of that. We had to take a bucket of warm water in winter because the water pipes were always frozen. In summer it was fun climbing on top of the toilet roof and jumping down again. My mother nearly had a heart attack every time. We had a coal shed next to the toilet and I can remember me betting with my younger brother to drive on the shed roof with his tricycle. that was very interesting as he missed the curve and fell off the shed roof getting catapulted by the washing line and falling onto the yard ground and the tricycle on top of him. For children a very nice time. Hi Sue, I also remember those outside toilets, we also had one of them in our house in St Helens road. I still know how we went, with a box of matches in your hand, along the garden path to the end of the yard where the toilet was situated. You could light a candle and sizzle some of the spiders which didn’t like the idea of being sizzled. In winter you had to take a bucket of warm water with you because the pipes were frozen. How I miss those nice outdoor toilets. Andrew, I do hope you see this, we lived 3 doors up from you and you were good friends with my sister Susan. Get in touch!!!! I was born in 1942 and during the war whilst my father was in the army and my mother was working in a cotton mill at Eagley I lived during the week with her eldest sister May Leigh, nee Thorpe, in Snowden St. Some of the happiest days of my life were spent there. Thanks for the photo. Hi Sue I have read your comments in Looking Back in B E News with great interest as I am the grand daughter of Arthur & Edith Roocroft and daughter of Norman. It would be good if you could let me know your connection with the family. My great-grand parents lived at No.6 and No. 19 Snowden Street. When I was born I lived at number 28 Snowden Street with my parents Kenneth and Dorothy Jones. I think I was five when we moved to Deane Church Lane. I remember the mill and the ginnel at the side. I have no photos of the street but this one could have our house on it. The only ones I have are of the interior, one of which is of me in a tin bath in the living room. I have only just found out that Humphrey Spender lived in the next street.